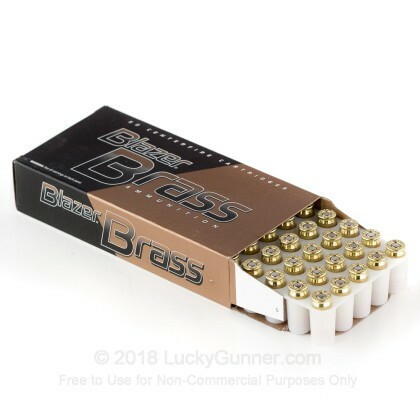 Looking for American made Brass-cased 380 ammo? Look no further than CCI's Blazer Brass line for reliability! This stuff chrono's better than most "range" fmj and is pretty clean. Best of all it will cycle in my finicky Kahr P380 and if you like penetration it is a good carry ammo. 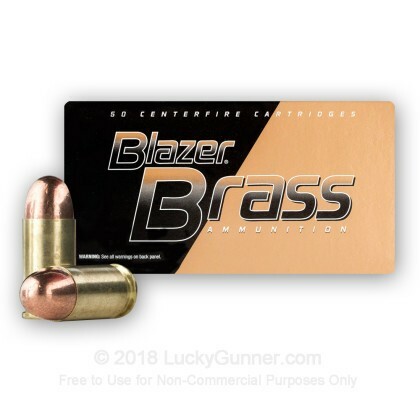 I have always had good luck with Blazer Brass and LG!!! This ammo works great in my Browning 380 ACP. I bought these for my Hubby and he said he has been very please with this product. Thank you very much. Bought these with confidence. I have purchased from Lucky Gunner before, so I knew what to expect. QUALITY. Ran these through my S&W Bodyguard. Not a hiccup. I will be back for more,. Referred Lucky Gunner to friends. My second order from you guys.Lucky Gunner is the Best.That can only happen with Good People.THANK YOU!! I get all my Ammo from LuckyGunner , never any issues with ordering , delivery or the products I use .Thumbs up LG. Very good ammo to practice with and break in a new gun.Lucky can not be beat for service and speed. They also do something which feels almost strange. They treat their customers with true respect. 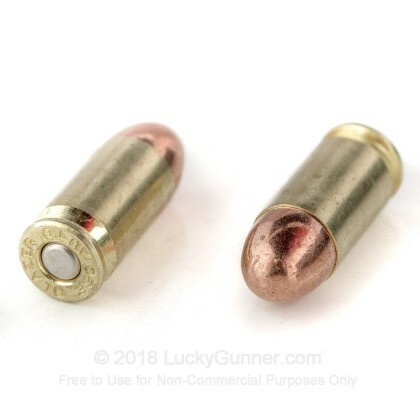 While no 380 ammo is cheap now, luckygunner is as reasonable as anyone. This is not my first it won't be my last. Give em your buisness and I'll bet you'll you'll be glad like I was! Works great in my LCP. Rounds loaded and fired as they should. Will buy more from Lucky Gunner, shipping is fast product is good. I am greatly satisfied with my order, prompt delivery and quality of the products. I am greatly satisfied with this order of mine, the prompt delivery, fair value and good quality of products. Shot 100 rounds in my S&W bodyguard without a glitch, for not being able to find much 380 in stock any where this was a great buy and would purchase more. Lucky Gunner shipped them fast as well. Had a little trouble finding 380 ammo, other than hollow point!! I can't say enough about the quality and service. I'm extremely happy to have found Lucky Gunner. I've tried other suppliers but these people are the best in service, price. and quality ! The only reason I didn't give it 5 stars is the amount of residue left behind. Although it was not so bad and was a really clean burn, nothings perfect. 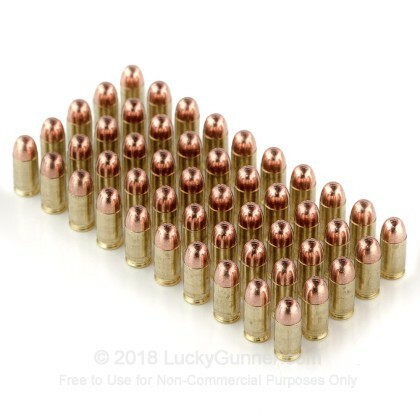 This ammo is well worth it and it's what I will buy in the future. I recommend this value and quality wise over all the others I looked at. 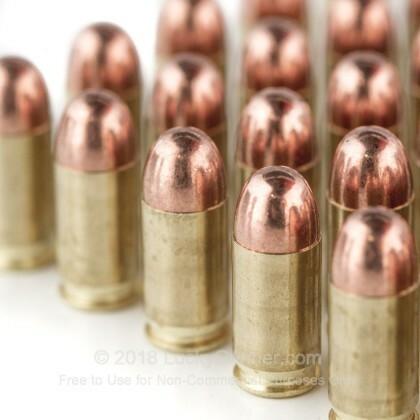 Expensive hollow points are not worth it. This ammo is plenty sufficient to protect you and to practice with. Multiple use ammo. I have never been disappointed with anything I have purchased form Lucky Gunner. Good price, Quick Ship and has hard to find ammo. What’s not to love? The only reason I put four stars on Performance is because I also reload. Unless you reload your own ammo, you won’t see any difference in performance. Hard to find .380 but LG has it. Price is good compared to others. Fast delivery and excellent inventory-updated websit so if they say they have it they DO! 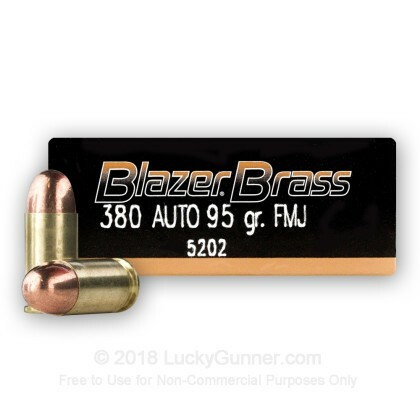 Q: Will "380 Auto - 95 gr FMJ - Blazer Brass" perform well in my Cobra CA .380? A: Hello Jermaine, Yes, these 95gr. FMJ rounds by Blazer in .380 Auto will work in your Cobra CA as long as it is chambered in .380 Auto. These are excellent rounds and perform very well. Q: Will this work for a WALTHER PK 380? A: Hi John, These 95gr. FMJ rounds from Blazer in .380 Auto should work good in your Walther PK 380. I haven't heard of any problems with them in that pistol. We also have this 380 Auto - 95 Grain FMJ - Blazer Brass- 1000 Rounds ammo in stock in a bigger quantity.